salt, pepper and a dash red pepper flakes!!! simmer all for about 8-10 mins then puree into a golden soup!! After having so much success with my flatbread, I needed something to dip m delicious breadsticks into. Now, keep in mind that I do not really enjoy most hot liquid, including soup. I also did not have most of the orange vegetables called for in the recipe (orange tomato, orange cauliflower, orange zucchini) so I used the 'regular' coloured ones. I also did not use the summer squash, so added a bit more zucchini. This soup is, without doubt, one of the best things I have ever eaten! It is tasty, heart-warming, filling, just plain delicious!! The colour came out as a beautiful orange, which made me want to eat it even more. The soup is thick (I didn't know how much water to simmer the veggies in, so I kept it to just a little bit and added as I needed to). 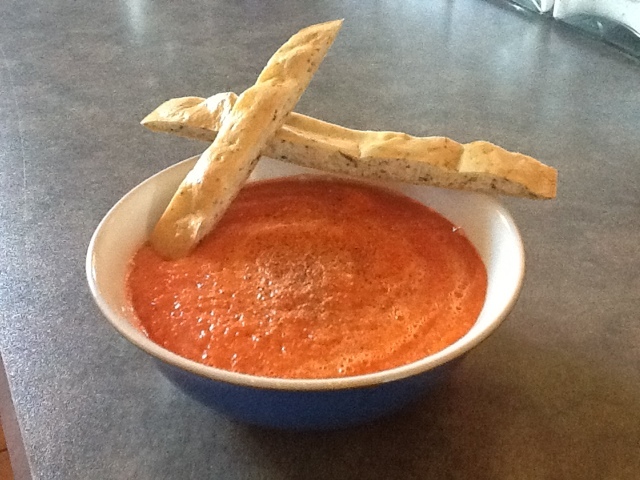 This was a perfect soup to dip my breadsticks. I have made it many times in the last few weeks, adding in vegetables that I have in my fridge, including roasted red peppers, cherry tomatoes, shopped up cloves of garlic, green peppers, different spices such as basil, oregano, curry powder, etc. The colour and taste varies depending on the ingredients, but I have been very happy with all of these different combinations. The best and most impressive part of this recipe is that my children also love it! The first time, I made a batch the size of the bowl, and it was not enough with the kids trying it and wanting some! Now, I make big batches that I can share wih the whole family, and put the leftovers into containers to bring to work.